Sometimes it’s good to be left in the dark. UNESCO World Heritage site Skellig Michael made international headlines last year—and it had nothing to do with its role in the next Star Wars movies. In 2014, the International Dark Sky Association declared the area Ireland’s first international Dark Sky Place, and the first in the northern hemisphere. Now officially one of the best places in the world to see the stars (and not just those with light sabres), Kerry International Dark Sky Reserve is a 700km area encompassing most of the Iveragh Peninsula and including Kells, Caherciveen, Valentia Island, Waterville, Portmagee, Caherdaniel and Ballinskelligs. There are only nine Gold Tier Dark Sky reserves in the entire world, and what defines all of them is an absence of artificial light pollution. Due to its splendid isolation between mountain and sea, this section of the Iveragh Peninsula is virtually devoid of public lighting, which may not be great if you’re attempting to walk home from the pub, but makes it the perfect location for stargazing. The Kerry International Dark Sky Reserve is officially twinned with the Aoraki Mackenzie Gold Tier Reserve in New Zealand. Apparently, we’ve been fascinated by the stars in this part of the world for a long time. Going back 6,000 years, the Neolithic inhabitants of the Iveragh Peninsula constructed stone monuments aligned with the cycles of the sun, moon, and stars, and some experts believe that ancient Ogham inscriptions found in the region may be notes on astronomical observations. On clear nights, the aurora, the Milky Way, and meteors are among the phenomena you can easily see, even without the aid of high-tech astronomical equipment. A decent pair of binoculars will show you galaxies of stellar wonders above your head, and the Dark Sky office at the former Garda station in Dugeagan, Ballinskelligs, County Kerry, also has further information. It has not been confirmed whether the Dark Sky designation influenced film director J.J. Abram’s decision to use Skellig Michael as a location for Star Wars: The Force Awakens and the following Star Wars movie, but the fact that there had been widespread coverage of the Kerry International Dark Sky Reserve designation may have been a factor for Dark Side location scouts. Kerry Dark Sky Group Chairwoman Julie Ormonde is promoting the area’s potential for so-called “astro-tourism,” which, combined with the unique natural environment should encourage visitors to come to the Iveragh Peninsula in winter and to stay longer when they get here. The Ring of Kerry is already a massive draw for tourists, but introducing a feature that is even more impressive during the darker times of the year should certainly prolong the season. Throw in the phenomenal appeal of the Wild Atlantic Way and you have an attraction (literally) made in heaven. 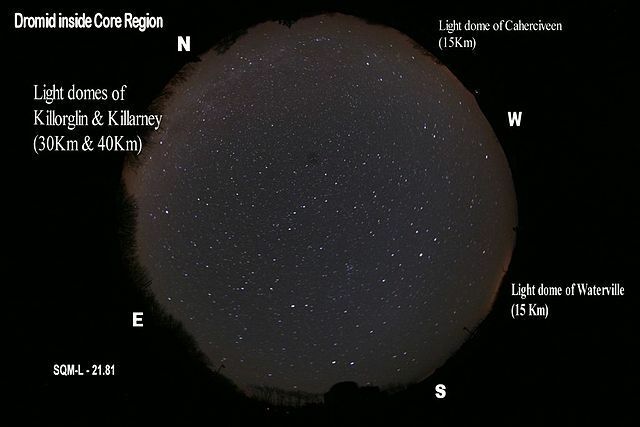 Have you visited the Kerry International Dark Sky Reserve yet? We’d love to hear from you!